It is finally time for our October Monthly recap! Find out which books were favorites and which were duds. We’ll end our wrap up with a a list of books due out this month and a glimpse of our upcoming content. We also want to hear from you so let us know what you read this month and what you look forward to reading in November. 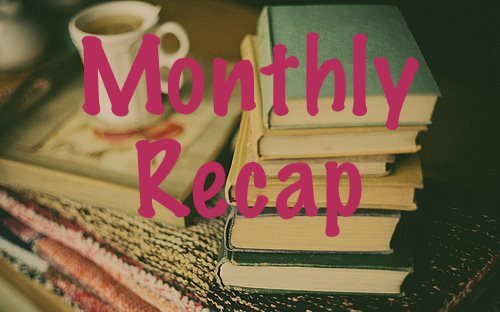 I blinked and now we are moving into August which means it’s time for our July Monthly recap! Find out which books were favorites and which were duds. We’ll end our wrap up with a a list of books due out in August and a glimpse of our upcoming content. We also want to hear from you so let us know what you read this month and what you look forward to reading next month. Time for our June recap! Find out which books were favorites and which were duds. We’ll end our wrap up with a a list of books due out in July and a glimpse of our upcoming content. We also want to hear from you so let us know what you read this month and what you look forward to reading next month. Make sure you read about our summer reading challenge and sign up before July 10 to play in a fun team challenge with a chance to win prizes. Time for our May recap! Find out which books were favorites and which were duds. We’ll end our wrap up with a a list of books due out in June and a glimpse of our upcoming content. We also want to hear from you so let us know what you read this month and what you look forward to reading next month. Time for our April recap. Find out which books were favorites, which were duds, and which ones we are most looking forward to the following month. We’ll end our wrap up with a a list of books due out in May and a glimpse of our upcoming content. We also want to hear from you so let us know what you read this month and what you look forward to reading next month. Time for our February recap. Find out which books were favorites, which were duds, and which ones we are most looking forward to in 2016. We’ll end our wrap up with a calendar of book-related events/facts coming up in February and a glimpse of our upcoming content. Time for our first recap of 2016! Find out which books were favorites, which were duds, and which ones we are most looking forward to in 2016. We’ll end our wrap up with a calendar of book-related events/facts coming up in February and a glimpse of our upcoming content. It’s time for our final monthly recap of 2015! Find out which books were favorites, which were duds, and which ones we are most looking forward to in 2016. We’ll end our wrap up with a calendar of book-related events/facts from the month of December and we’ll highlight our January content. We’ve also added a list of upcoming book releases for January 2016 (scroll to the end for the list). It’s time for our monthly recap! Find out which books were favorites, which were duds, and which ones we plan to read the following month. We’ll end our wrap up with a calendar of book-related events/facts from the month of November and we’ll highlight our December content. We’ve also added a list of upcoming book releases for December (scroll to the end for the list).